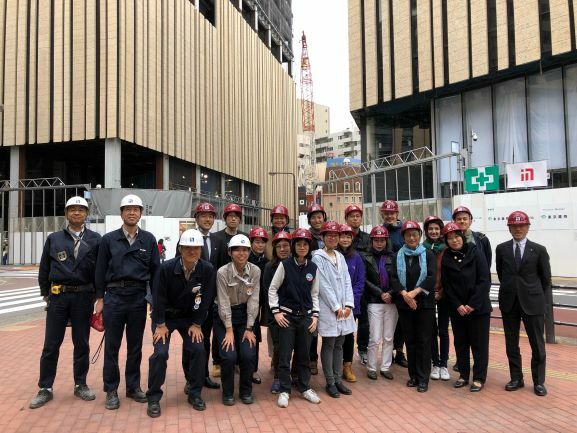 On November 13, 2018, 2018 Raccoon members visited Kajima's construction site "Toshima Project". We gathered at a place that sells lottery tickets near Ikebukuro Station. As Ikebukuro station was so big, it was very difficult to find the lottery counter. Kajima's construction site was just a ten minute walk from Ikebukuro station. I was surprised to see Ikebukuro so busy. "Toshima Project" consists of three buildings -- buildings A, B, and C. This time we were only able to visit Building A and B. Before entering the buildings, a person in charge at Kajima kindly gave us an explanation of the project and construction process for about thirty minutes. Although I know nothing about the construction business, I gained an interest in this project through listening to his explanation. For example, I had never heard of the word YOUSEKIRITU (ratio of building volume to lot) and I could realize the importance of YOUSEKIRITU? This ratio is decided by the government and the internal space of a building cannot exceed it. In the case of Toshima Project? this ratio around Ikebukuro station is 800% and the space on the given size of the land is fixed based on this figure. Given this figure, in order to maximize the profit of the whole project, Kajima planned to balance out the space of Building A and B. Namely, Kajima minimized the space of B and added it to Building A. This is because Building A is closer to the downtown area than Building B and the value of the space of Building A is higher than that of B. Through doing so, Kajima sought to maximize the value of the project as a whole by shifting the space of Building B to Building A. The concept of each building will also be different. Building A has theaters and restaurants, whereas Building B is an office tower. I was deeply impressed by Kajima's way of thinking. After his explanation, we visited Building A first. Kajima had finished their underground work and were getting to work on the ground level. There will be a movie theater in Building A in addition to ordinary tenants. When we visited the site of the movie theater, they had just finished laying the concrete and we could not see the interior. We, the 2018 Raccoons, made a promise to watch a movie there in the future. I was impressed when I saw a display slogan which proclaimed "Let's work together, not become a nuisance to the neighbors". There is only ten meters from the site of Building A to the next building. I thought first that the noise from the site would surely be "a nuisance to the neighbors" in the building next door. But, once I stood on the concrete floor, I could scarcely hear anything. People may not even be aware the noise caused by the construction work. In addition to being a technical achievement to eradicate noise, I think this is an aspect of the Japanese culture of OMOIYARI? in which one is afraid of being a nuisance to one's neighbors . We moved to Building B which has a big theater which is almost completed. We went up to the stage with anticipation, and standing there listened to an explanation by a Kajima employee about anti-earthquake countermeasures. This theater will open soon. As we stood on the stage as the first guests, we promised again that we would come together to see a play here. I sincerely thank the employees of Kajima and the staff members of the Atsumi Foundation for giving us this wonderful experience of visiting the construction site.